I am surprised at how little fuss there has been over Max Mosley's plan to have a total freeze on engine development for ten years. Apart from the obvious objection that this rather negates F1's claim to be the pinnacle of racing technology, has no-one noticed that it is in complete contradiction to Mosley's previously-stated aims for the sport? In May of this year, Max outlined his blueprint for the future, saying that "he wants to see the regulations changed from the current 2.4 liter V8 format to 2.2 liter turbocharged V6s running on biofuel and developing 100 bhp less than at present." Now it seems that has all been thrown away without even a backward glance and the future is to be the present. The reason given for this sudden decision to stay in one place is that it will "enable the manufacturers to concentrate on developing systems such as regenerative braking systems". So it is not that Max has been reading my blog and realized that the global warming scare is a load of old hooey; he still wants to see strange energy-saving devices bolted on to the cars. But this ignores the fact that the present engines are the central focus for any green protest at the guilt of F1 for the warming of the earth. They use fossil fuels and pump out carbon dioxide, for pete's sake. As though Max had forgotten his concept of an enviromentally friendly F1, he wants to keep the gas guzzlers that cause the imaginary problem. And save a little bit of their energy for re-use. Am I the only one who can see a departure from reason in this? Does no-one else begin to feel that Mosley's marbles are disappearing with increasing rapidity? How long can the sport support a president who changes its direction every few months? The manufacturers submitted proposals for engine changes that were in line with the vision for the future that had been agreed between themselves and the FIA - but Max said immediately that he would push through the ten year freeze regardless of objections. 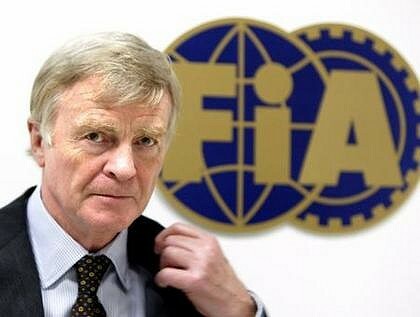 That alone is good cause for concern regarding Mosley's certainty that only he knows what is right for F1. But is it not more worrying that his engine freeze is in direct opposition to previously declared intentions? It is as if he does not really care about anything but his own absolute power. No matter how irrational the proposal, if you disagree with him, he will merely over-ride your objections and force it through. It seems that everything has become personal for him, as Jackie Stewart discovered recently. I am in two minds over the situation. On the one hand, I fear for Max's sanity. But on the other, I have to rejoice that he is revealing the extent of his madness and must soon be removed from his position, thereby allowing more reasonable minds to take over. The only questions that remain are: how long will he be allowed to continue and how much damage will he do to the sport in that time? I am tired of disagreeing, ridiculing and chiding Mad Max.....I have resigned to the principle of "whatever".......when was the last time he brought any sensible proposal to the table? I am tired too, Uppili - that's why I want him gone! Wouldn't it be amazing to have an FIA that we could actually agree with occasionally? However, given your thoughts on climate change do you think F1 should be looking at alternative fuel technologies? Should manufacturers? And if so, is it because of dwindling resources or the environmental impact? As harsh as it might sound, I don't see Mad Max vacating the post till he is alive, Clive. I am fascinated by alternative fuel sources, Neil, as there is some very interesting work being done in that field now. We have to find viable fuels because, regardless of any environmental impact, fossil fuels will run out sooner or later. Since our civilisation is completely dependent on such fuels at the moment, not to seek other sources of energy would be foolhardy, to say the least. The trouble is that F1 is embracing the idea without examining the consequences of each suggested alternative. Top of the hit parade at the moment are bio-fuels, basically oil from crops, and they are already proving to be a disaster for third world countries. The States has invested heavily into bio-fuels, mainly from corn, and the result is the price of corn in Mexico has gone through the roof and the poor can no longer afford to buy flour for tortillas. Everything has a knock-on effect and needs to be examined before we jump in. Oil from crops? That's land that was growing food and now grows fuel - how are we going to replace the food? The only viable answer as far as I can see is hydrogen. It is beautifully simple, would power our existing engines with minor modifications, gives an approximately equal amount of power to petrol and the product of burning it is... water. The problem with it has always been that producing hydrogen requires electricity so we're back with the old cycle of fossil fuels powering the generators that then supply the electricity - looks clean but isn't. Fortunately an amazing breakthrough has just been made at Perdue University - they have discovered that dropping pellets of an aluminium alloy into water creates a reaction that produces hydrogen. They have set up a company to make small motors that run on the hydrogen produced in this way and, ultimately, will be selling the technology to car manufacturers. So there is hope. And that is what really annoys me about the global warming debate - so much of what is said is skewed information, bad science or deliberate misrepresentation. To take one example: it has been proved repeatedly that CO2 levels follow a rise in global temperature and do not precede it. They cannot possibly cause it therefore; but the old litany of CO2 being the death of the earth continues unabated. It's a political issue now, that is the problem, and Max has fallen for it hook, line and sinker. The car manufacturers have to give lip service to it because they need to sell cars - but they know it is absolute nonsense. In a few years time, some other threat to the world will have been identified and become the trendy thing to worry about. All this global warming business will be forgotten as the seas don't rise and we aren't burnt to a frazzle - the gullible will move on as they always do. But those who really care about the future need to be aware that there are problems and we must look for solutions. We should not panic and start doing crazy things like pouring tons of iron oxide into the oceans, as the global warming idiots are doing at this very moment. Clear sight, careful study of the data and a cool head are what is required. We can do it as long as we don't let the politicians drive it. Hi's just lost it, officially. Totally nuts. 10 year freeze? By the 3rd, NASCRAP will be faster than a GP car. Now, why the teams keep listening to him (and hence, the FIA)? Is it really that hard that all teams unite (HA!) and boicot the FIA and start a F1 of their own? Without FIA's aproval, support or whatever? I'm most likely talking nonsense here, but, can it be done? Max will never go of his own free will, Uppili - on that we are agreed. He needs to be removed, gently but firmly, and by men in white coats if necessary. "How much more can the manufacturer teams put up with, Sidey? Surely they must be talking in the boardrooms by now... "
about what though? they tried with the GPMA and look what happened there. A breakaway F1 has been threatened often enough in the past, Haplo, but somehow nothing has ever come of it. Max narrowly avoided it by actually sitting down to talk with the manufacturer teams. But, when he proves time and again that agreements mean nothing to him, there must come a moment when the teams revolt and either arrange for him to be deposed or start a rival series of their own. I think a breakaway would be a mistake - look what happened to CART. It may be difficult in terms of FIA rules but the sensible solution is to get rid of Max and rewrite the way motor sport, especially F1, is governed. In 1848 there were revolutions throughout Europe, Sidey. All failed to replace the established order and things went on much as they had before. But then came 1917 and the Russian Revolution. Because something doesn't work the first time, doesn't mean that it will never work. We are talking about a dictator here, after all, and dictators get deposed in the end. Max must go! Man that is alot of information in a small package. OK I am interested in hearing more about the hydrogen project at Perdue University. I agree that regardless of the global warming debate we are going to run out of oil well maybe not out but it will become so expensive we will not be able to use it. I also agree about biofuel not being the answer. I do not want the worlds bread belt to turn into the worlds energy supply fields. We all need to eat. This "freeze" for instance is going to have its own domino effect. Now the fact that Max can not see this is in itself lunacy. Max had the final word, but couln't someone have talked to him about it. I think the term "groupthink" is what happened here. Individually this is a foolish decision, but to a group it sounded perfect. Clive, you raised issues that I hadn't even thought about. I was mainly concerned with engine technology stopping. How narrowminded of me to only think of this. The whole of the decision is what needs to be analyzed. Though I do not think that in three years NASCAR will be faster. I seem to remember that about ten years ago CART was faster. Scott Pruit qualified at 240 mph at Fontana California speedway. So all auto racing has realized that it is not speed per say but how you drive. There comes a point that the driver can no longer feel the road and engine size or something must be addressed to slow the cars down. I did not want the future developement for faster cars. I was looking at technology is making the engines more efficient. Not just for the environment but efficiency. Because an efficient engine may make the car lighter which in turn makes it go through the corners easier. So until I read this article even I hadn't thought of all the facets of this poor decision. I feel that we as fans are just worn out from this season. Bernie or Max can pretty much do what they want and no one is going to flip out because we are just to damn tired. I am saddened by all this talk of 'revolution' but equally I am glad to hear that there ARE those that still think that F1 is the pinnacle of engineering excellence. And that those same people propose change because it is the Natural order of things. F1 is nothing if not a collection of eccentrics who believe that they alone can build a car that will outperform any other within the rules of the game. And it is the rules of the game that have got in the way of a fine example of human endeavour. Yet we must have 'em. It is clear that Max Must Go. But, as previously mentioned by many, he will not go easily. How on earth can the sport 'progress' with a halt on 'Engine development?' What!? Bad analogy perhaps but the point is that F! is a forward, progressive movement toward perfection in all areas related to car development and engine management. If the teams accept this ruling without some sort of revolt then they are NOT worthy of continuing in the sport. Get that man away from F1! Looking forward to the tiddlywinks championship and hoping that sattelite tv are covering it! Details of the Perdue University discovery are in this article from their news archive, John. If only the news media would report important breakthroughs like this instead of telling us polar bears are drowning because the arctic ice is melting (polar bears habitually swim hundreds of miles on hunting expeditions)! It's true that CART often reached higher speeds than F1 - inevitably so once F1 stopped using turbos and also never races on ovals. But, as you say, it's not really about sheer speed. It's the combined performance of machines at the very edge of technology together with humans functioning at the limit of their abilities. And that is another reason why Max's engine freeze is so wrong, of course - F1 is technology reaching beyond what we already know or it becomes something else entirely. Efficiency is everything in engine technology. With the 3.5-liter formula, there was a reason why everyone ended up with V10 engines and it wasn't mandatory. The optimum volume of a combustion chamber can be calculated and this then dictates how many combustion chambers you need for the best fuel/energy output at any given engine capacity. For 3.5 liters, it's 10 cylinders; drop the capacity to 2.5 liters and the optimum becomes 8 cylinders; and so on. Max's specification of V8 engines for the 2.4 liter formula was entirely unnecessary, therefore - it is a configuration that the engine designers would have gone for anyway. It's just another instance of the FIA pushing its nose in where it's not wanted. Good question, Fractal - who will take over? My own suggestion, given at first in jest but I like it better the more I think about it, is Alex Wurz (young blood in the FIA - whatever will Crazy Clive come up with next!). But a more popular candidate, and one I would heartily agree with, is Jackie Stewart. Perhaps Alex could be his sidekick. Replacing Bernie is not so easy. What is needed there is someone who knows and loves F1 but also understands the needs and possibilities of television and the internet. Mind you, I could think of a few bloggers who would do a good job, starting with young Sidepodcast himself - he could have Christine as PR and Alianora as reality check! Thank you for the article from perdue. Unbelievable but true!! If they keep it from us long enough more people watch the nightly news as long as the news is bad. All right I am really tired. Why couln't he just have waited a month or two. Put out feelers to the manufactures before he makes such a drastic policy decision. The answer is that" MAX MUST GO." Say it three times fast. Yup, it's what I've been saying for a long time. There's no way that this will last ten years. Spec engines can't be more than five years away. Isn't that what Max really wants to see anyways? He said as much about the chassis design. But what do they mean exactly when they say "development"? What sort of things can a team do to their engine? If their 2008 engine is 30 bhp weaker than the front-runners, are they stuck with that power deficit for at least five years? Would there be any way they'd be allowed to claw back that deficit to stay competitive? What sponsor would stick around with a team in that situation? All good questions, Eric, and ones that the FIA need to answer. Although the present engines are pretty close in performance, they are not identical, and that makes the freeze very unfair for those whose engines are not quite as powerful as others. I think that the issue of reviewing in 5 years is to address the problem that Eric raised. But there are many more problems associated with this decision that need to be addressed--very soon. Otherwise, I've reached the "ignorance is bliss" phase when it comes to Mosley and Ecclestone allowing words to leave their mouths, and for the moment, I interpret this incoherence to mean that engines will not be the focus of development until he lifts his hand and says it's okay again. How does he know that the teams are going to develop KERS instead of aero, the latter of which, I think, is the great divider right now? What F1 needs is a wing freeze. Where does he get these ideas from and why is he so determined that they will be ratified in spite of the objections of everyone but his cowed council? It is truly weird in a year of weirdness. What you have to realise is that Max Mosely and the manufacturers are attempting to get the upper hand on each other with regard to having power over F1. The manufacturers have had control in F1 ever since the deal to end the GPWC threat was signed. This move may well be simply another blow in that battle, with little regard given to anyone who chooses to live on, or watch, the chessboard. If that is the case, Alianora, it is clear that Max hasn't given up the struggle. Since this must mean that it is pointless to make agreements with him, will not the manufacturers be forced to bring an end to the game by getting rid of him? In theory, yes. In practise, the manufacturers are no better at keeping agreements than Max Mosely. As a result, the manufacturers have no chance of setting up a rival series. Also, they have no method of sneaking into the FIA to remove Max, any more than Max would have the power to sneak into the manufacturers' boards and remove their leaders. I suppose in a way they deserve each other... ...it's just that neither of them deserve to have power, and both have it. To F1's regret. That was me, by the way. I thought I'd typed in the security code into the security line - evidently it thought I'd typed it into the name line as well for some reason.